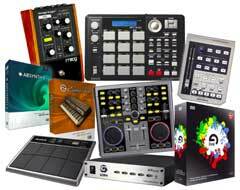 The guys at Create Digital Music (a great blog and community site on digital music making) are having a big giveaway with over US$4,000 of hardware and software. All you have to do is fill out an online form with your information for a chance to win (unfortunately only US residents are eligible to win, but international folks can also enter to get other stuff as well). Sounds great right? The contest ends Monday, June 11, 11:59 P.M. NYC (US-Eastern) time. Enter here. Check out and bookmark their site while you are there, “Create Digital Music” provides great information on digital technology.